We're excited that you are interested in pursuing a Nursing degree at Belhaven University. Nursing is a discipline, a profession, and a service. Admission to Belhaven University’s bachelor of science in nursing (BSN) program is competitive and enrollment is limited. The School of Nursing Admission Committee encourages all candidates to submit their application as early as possible to allow for adequate processing time. Application for admission to the Nursing Program is a separate process from application to Belhaven University. However, in order to apply for admission to the nursing program, one must also be admitted to Belhaven University. Students must complete the general education and pre-requisite courses prior to applying for admission to nursing program. Students are selected for admission to the nursing program each Fall semester. The deadline to file application for admission is March 1. Acceptance of admission to Belhaven University does not guarantee admission to the Nursing program. 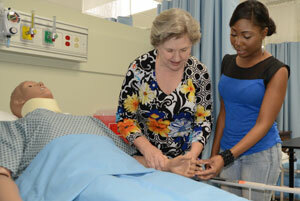 Admission to the nursing program is a highly competitive process. Only applicants who submit complete applications are considered for acceptance into the program. It is the responsibility of the student to assure that their admissions files are complete. Completed admission packets should be sent to: Office of the Dean of Nursing, Belhaven University, 1500 Peachtree Street, Campus Box 313, Jackson, MS 39202. Submitted copies of all transcripts from all colleges or universities attended. Progress report of academic standing for any required courses in progress at date of application. The report should include name of course, where enrolled, and expected date of completion. Submitted a one-page typed essay by the deadline. The essay is to include a discussion of the applicant's interest in nursing and a personal reflection on how enrollment in a nursing program grounded in Christian principles might facilitate development and practice as a professional nurse. All of the above components will be evaluated as part of the admission decision. Students who are applying to the School of Nursing must earn a minimum score of 66 on the ATI TEAS (Test of Academic Skills). The ATI TEAS is a national nursing school entrance exam designed to assess whether prospective students are academically prepared for learning nursing-related content. These skills are deemed important for success in the nursing program. The exam contains approximately 170 questions be completed in approximately 4 hours. The exam covers academic subject areas including math, science, English, and language usage. The fee associated with taking the ATI TEAS exam is the responsibility of the student and is not included in the tuition fee to the nursing program. See the ATI TEAS Testing Information for fees and registration information on the TEAS-V exam. Obtaining the required minimum score on the ATI TEAS exam alone does not grant nor guarantee admission into the Belhaven University School of Nursing. Belhaven University will only consider three (3) attempts at obtaining the minimum required score on the ATI TEAS exam per 12 month period. There is a 30 day waiting period between retakes. It may be helpful to speak with a nursing advisor to help you prepare for this important exam.